Nazzareno (Rome, Italy) on 3 July 2014 in Abstract & Conceptual. Maybe it was not murder, but a really big mistake. Bottle of red wine has been dropped and broken. Whichever way you look at it, it is a crime . . what a waste ! @Ronnie 2¢: A terrible crime ! A very cool scene to shoot! Oups, impressionnant au 1er coup d'oeil. Cele ferait une bonne couverture de roman policier! This is the mess :))))))))))!!! Bella giornata, ciao ! Catherine. Très belle composition et très bon titre. Une photo magnifique. Great image and amusing title, well spotted......Or did you the bottle of wine self thrown on the ground. Même au supermarché tu emmènes ton appareil, et tu as bien fait!excellent! The police searched through the shop but found no clues! Eso es tener la cámara de fotos a punto!!! Definitely a crime scene. What a waste of good wine but, a great photo op. Had I not seen the broken bottle, I may have believed the title of this post! Great find and capture!! Ahhhhh ! :-) très bien vu ! Fabulous image! A great title! 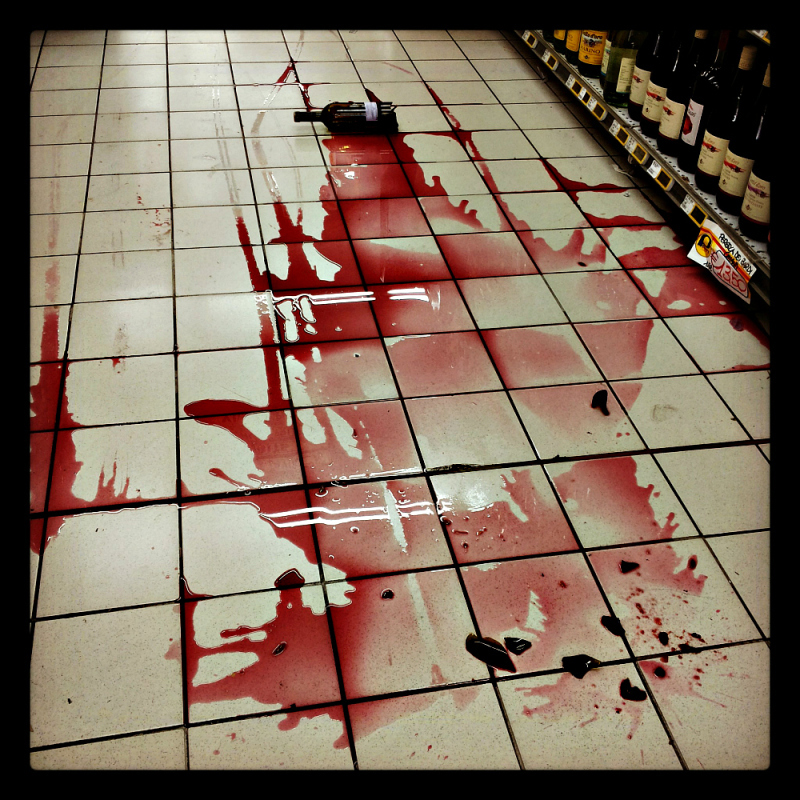 Not sure if that is wine or blood there on the floor or both! But in any case, what a waste of fine wine! Ouch !!!!!!!!!!!! Si Sir Alfred H. voyait çà !!!!!! !